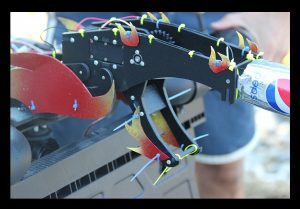 champlain College’s ChampBot came in second place at this year’s Mini-Maker Faire. However, many people who are a part of Champlain College’s community are not aware of the ChampBot Challenge, and others have no idea what a “ChampBot” is. So we bring you this blog post as an effort to inform those who seek to learn a little more about the “Champbot Challenge”. The challenge takes place in the midst of the Mini-Maker Faire festivities at Shelburne Farms. It is one of the most anticipated events at the faire, because it serves as great entertainment as well as a chance for makers to show off their technical, mechanical, and creative skills. Furthermore, the true challengers of the race “ChampBots” are remote controlled robots, made in the image of the notorious lake monster Champ. These robots have to complete a provided obstacle course with utmost efficiency in order to win the challenge. To further understand the Emergent Media Center’s individual ChampBot, we took our efforts to the MakerLab, where the bot was created. Here, we interviewed members of the Sandbox team, a group of MFA and undergraduate makers, designers, and programmers who experiment with technology and interactive design. The team helped us get an inside look at what it takes to get one of these bots up and moving. It all began with a list of obstacles, provided by the faire, that created basis for what the bot had to achieve during the course. Listed were functions like navigation, release, and ignition. In preparation, the team used a prototype made out of wood. 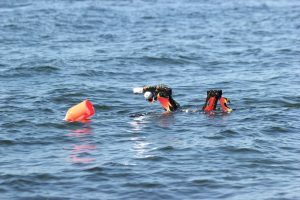 It served as a two-dimensional example of how the robot would float and move in water. The prototype also helped the team make decisions as they pondered on what functions to tackle in the challenge. Along with a lot of waterproofing, the team also used a device called an Arduino that practically brought the robot to life. The Arduino is a specialized microcontroller that is used primarily on DIY projects because it is inexpensive and easy to use. It is programmed by the user through a computer to read sensors and direct the robot’s actions. With the Arduino, the robot is able to interact with the environment as if it were a living being. 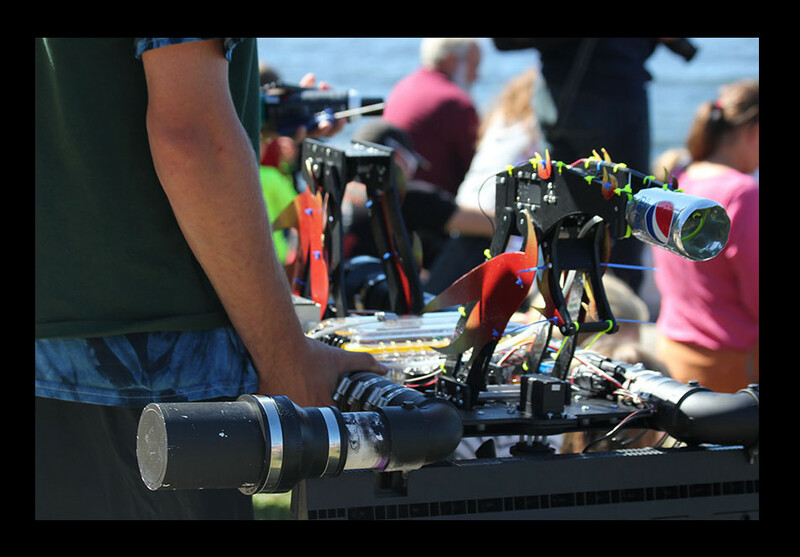 Champlain College’s ChampBot was built with two remote controlled motors attached to propellers that enforced steady navigation. The Sandbox Team also tackled navigation with pipes along both sides of the bot. The front of the pipes were filled with air and bent outward for stability while floating. The Sandbox team also decided to complete the ignition challenge, which means that the bot had to navigate its way to the target and ignite it by breathing fire. 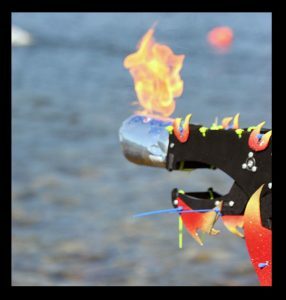 To accomplish this, the team used a butane tank attached to a tube that was fed through the bot’s mouth. In front of the mouth they installed two wires, that created a spark when rubbed together. Butane + Spark = Fire. All of the Sandbox Team’s work in the MakerLab contributed to the ChampBot’s second place win. As a result the excitement and anticipation for next year’s ChampBot Challenge at Shelburne Farms Mini-MakerFaire is at very high stakes! Interested in learning more about ChampBots? Stay tuned to the blog. We’ll be sharing interview episodes, behind the scenes footage and more about the process of getting ChampBot ready for the challenge!